Coming back to Brundish, I arrived by car. I mention this because the previous entry for this church began with a long account of how I had cycled out from central Ipswich, visiting other churches on the way, the countryside getting wilder, the villages more remote. It was the day of the 2001 Suffolk Historic Churches bike ride. What I most vividly remembered was asking for directions. Chatting to the nice lady at Badingham about her splendid church, I'd asked her if I should turn right outside if I wanted to get to Brundish next. "Brundish?" she replied. "Not sure. That'll certainly take you to the Framlingham road." At the house on the corner, I asked again. "Well now", said the man in the garden, straightening up. "That'll be the road to Stradbroke. Not sure about Brundish. Is it a village out that way?" If I remind you that I was, according to the map, barely three miles from Brundish at this point, it might give you some idea of how insular the villages of high Suffolk are. And even returning by car, from the north this time, I felt how quiet and remote the lanes were, especially once you get off the Stradbroke to Dennington road. The great unbuttressed expanse of the tower of St Lawrence was originally Norman, and the lower part survived the complete rebuilding of the church in the late 14th century. Inside, the original Norman tower archway is now filled in. Around the corner is the later porch, probably a century younger than the nave against which it is built. It is a lovely thing, although the workmanship of its join to the south wall is a bit shoddy, frankly; a reminder that not all medieval builders were master masons. You see something similar at Thornham Magna. The south door, excitingly, is contemporary with its doorway, and the lock is probably original too. You step through, into what I still think is a quite remarkable interior. It is full of light, a wide open space, cavernous, with a chancel huge enough to shrug off its Victorianisation. There is a superb echo, deep and resonant. The effort of singing here must be amply repaid. "You and I could stand under that chancel arch and sing an aria", said the nice lady who welcomed me on the occasion of my first visit here, "and we'd think we were at Covent Garden." Much has happened since my previous visit here. Then, I was struck by an air of sadness and decay. Today, this is a church in a parish which has obviously galvanised itself, and this beautiful space feels loved and cared for, and well-used. And the light! Even on this day of cloudbursts, the white light fell evenly across the brick floors, the old woodwork, the brass lamps. It is enchanting. There is no Victorian stained glass at all - what little there was was removed by a stray German bomb in 1941 - and so the interior is simple and dignified, with a real sense of its 18th and early 19th century integrity. Although the interior as we see it today is the result of the sacramentalist reordering that virtually all English churches underwent in the 1850s and 1860s, most of the furnishings are much earlier. Indeed, the final range of seating is medieval, with surviving, damaged bench ends. One purports to show an angel, another part of a griffin. But I wondered if they might actually be evangelistic symbols of St Matthew and St Mark. There is more heavily vandalised but similarly devotional work nearby at Tannington and Bedingfield. And this is not all. The box pews are a delight, dating from a time when the pulpit was probably in the centre of the church. However, if you look closely, you'll see that some of them actually contain medieval benches. Even more exciting, there is a medieval misericord chair, bolted down in the north doorway. You lift it up, and underneath are the shadows of elaborate and mysterious carvings. Someone called J Pollard is commemorated on it, at the age of 92. Was he an elderly parishioner who sat in it, perhaps in the 18th century.? Was his name painted here to remember him when he died? The Victorians didn't do a lot here. We are a long way from anywhere here, and this has never been a rich place. Out here, people mend and make do. As I say, a helpful German bomb removed the 19th century glass from the east window of the chancel, but why is the church so full of light? It doesn't take a great deal of imagination to conjure what it was like here on the afternoon of Monday April 3rd, 1644. This was the day that William Dowsing, the self-appointed official visitor to the counties of Cambridgeshire and Suffolk visited, to make sure that the Parliament's edicts against idolatry were being enforced. He started the day at either Cratfield or Kenton (his journal isn't clear; White suggests the former, Cooper more convincingly the latter) and then came on through Bedingfield and Tannington, both places where he found much to do. His journal records his activities here at St Lawrence: There were 5 pictures of Christ, the 12 apostles, a crucifix, and divers superstitious pictures. The vicar have 2 livings. When you read Dowsing's journal, you start to fall into the rhythm of it, and it is possible to unpick this entry and comprehend exactly what happened here. Firstly, the word pictures means images in stained glass. So here, Dowsing records five stained glass images of Christ (probably a Gospel sequence, particularly forbidden) and divers (various) superstitious (theologically Catholic) pictures (probably legends of Saints, but possibly Gospel scenes). Although theologically very articulate, Dowsing isn't always very accurate, and it may have been a range of saints other than the twelve apostles that we traditionally understand by this reference. It is interesting that he does not use the word pictures when he mentions them. As we shall see, it is possible that these particular figures were not in stained glass at all. The crucifix was probably a surviving external stone crucifix, most of which had already been destroyed already elsewhere. It may have been on the gable end of the chancel. The vicar of Brundish enjoyed two livings, that is to say he was Vicar of two places, because it was technically a chapel of ease to Tannington, two miles away. The puritans frowned on plurality, because it was a sign of a leisured clergy who paid a pittance to curates to do their work in their various parishes for them. But we do know that the Vicar here was a strong supporter of Dowsing and the puritans. His name was Edmund Evans; the previous year, he had put his name at the top of the local list of solemn league and covenant sympathisers, expressing support for the abolition of Bishops and of the episcopal church, and its replacement with a presbyterian system of church government. He would no doubt have encouraged Dowsing's work here, rejoicing in the sound of coloured glass crunching underfoot. A year after Dowsing's visit, he was dead, at the age of 61. Fragments of glass survive. There are some in the nave, and a few in the wide, beautiful east window that otherwise engulfs the chancel with bright light. And much else has survived. Brundish's greatest treasures are its brasses. The most famous of them sits under a tomb canopy on the north side of the nave. This isn't the brass's original position, but it is in remarkably good condition. It is to a Priest, Sir Edmund of Brundish. It doesn't mean he was a knight - Sir was a courtesy title afforded to pre-Reformation Priests. There are very few surviving brasses of Priests in Suffolk; probably the best-known is at Melton. Even more fascinating is the inscription beneath it, which is in Norman French: Sire Edmound de Burnedissh iadys person del esglise de castre gist icy dieu de salme eit mcy. Despite the invocation for prayers for his soul, the inscription survived Dowsing's visit - as John Blatchly observed, it was usual for Dowsing to leave inscriptions in French alone, but inscriptions in Latin were destroyed or damaged. We may be sure that Dowsing, an educated man, could read Norman French. But he did not destroy it. This suggests that Dowsing believed that ordinary people could read Latin as late as the 1640s, but not French, which is very interesting. A smashing palimpsest brass lies about ten feet to the south. This is to John Colby and his wife Alice. Pictured beneath them are their 4 sons and 9 daughters. John died in 1540, and Alice in 1560, so what appears wholly medieval here actually dates from after the Reformation, which we may assume was a time of great ferment and theological debate, even in Brundish, where the minister was staunchly puritan. Part of the original brass that was cannibalised for this has been traced to another church in the West Country. There are other brasses, several of them to Colbys, up in the chancel, one who has a charming inscription, which is also interesting because it is one of the earliest post-Reformation memorial inscriptions in Suffolk: Within this grave entombed lyeth a man of noble fame, a souldier to the Prince was he, John Colby night his name. he lived fforty years and nyne in credit with the best, and dyed such as here you see, his sowle in heven doth rest. Another, from early in the following century, shows Thomas Glemham kneeling at a prayer desk with the inscription Yf life in God, and like of good, yf love of Christ, and eke his word, yf strif with vice, as fire with wood, Yf death with faith, in thouly Lord, are tokens sure of endles bliss, which god prepared, hath for his, then Thomas Glemham, here doth lye, who rest with Christ, in heaven lye. There were once more. Some that are now missing were certainly still here in the early 19th century. When I first came here in 2001, I thought something else was missing, too. I couldn't see the Laudian tester to the pre-Reformation pulpit, which Cautley had seen displayed beside it. Looking, we found it stacked in the space beneath the tower, but today it has been proudly reinstated to its proper place. Dr John Blatchly had also found panels of the roodscreen beneath the tower while researching the new edition of Dowsing in the early 1990s. He discerned through the red and green paint the deep scratches and gouges left by iconoclasts at the level where the faces of the figures were. Were these figures the 12 apostles mentioned by Dowsing? We usually assume such screen vandalism to be the work of reformers of a century earlier, but is it possible that Dowsing himself may have done this? Ten years ago, before this parish took itself to task and restored St Lawrence to the condition you find it in today, I observed that it was an indictment of all of us that the wholly dedicated and honourable people of this parish had to bear the burden of attempting to secure the survival of this church. St Lawrence was a national treasure, I said. Its loss would be a national loss, and its care should be a national responsibility. Despite the excellent care of this building today, what I said then is still true, I think. 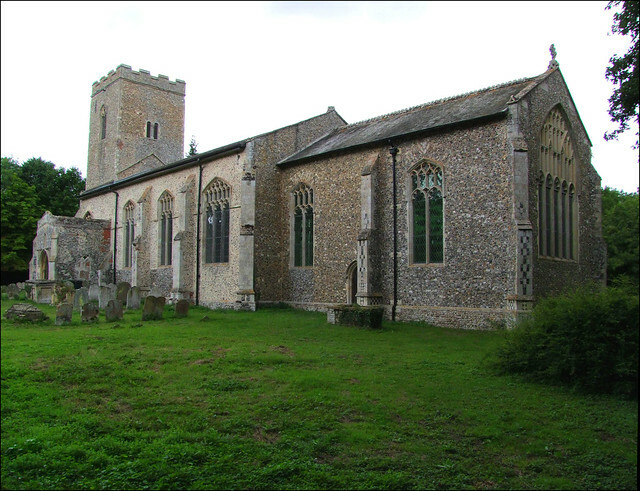 There are now several churches in East Anglia where the parish is simply not coping with caring for their church, and this situtation is likely to increase as rural Anglican congregations shrink, not least because their villages are taken over by outsiders who feel no stake in the long generations of the parish.